by Bob Johansen. Berrett-Koehler Publishers, 2012. Bob Johansen is a social scientist and futurist who served for ten years as the president of the Institute for the Future. He has a keen interest in values and religion. He also has a deep concern about how leaders should prepare to lead in a dynamic and change-ridden future dominated by electronic media and the internet. He offers ten skills to help leaders prepare, train and evaluate themselves. The future, he asserts, is all about listening ten years ahead. Leaders need to look deeply within to connect with their inner drive to build and grow things, while connecting with others. They need to discover not only what leaders are doing, but how flexible they can be in response to challenges, i.e. how dilemmas can be turned into opportunities and how leaders can learn from directions taken, innovative thinking, the importance of networking, and creating a collective commons where wisdom can be shared. 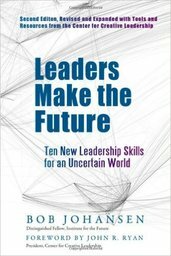 He also presents a “futures lens” to help leaders develop competency models and a Leadership Skills Indicator exercise. The reader is supplied with dozens of helpful diagrams and examples. Congregations working on strategic planning or visioning might find this a helpful book to consult.